A Digimon which has an appearance like a dinosaur that still retains its youth. 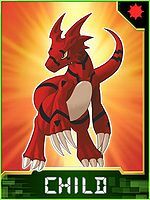 Although it is still a Child, its potential as a "Combat Species", something which all Digimon naturally possess, is very high, and it hides the ferocious personality of a carnivorous beast. The mark drawn on its abdomen is called the "Digital Hazard", which is inscribed on those that have the potential to cause massive damage to computer data. However, as long as this ability is used peacefully, it can probably become a being that protects the Digital World. 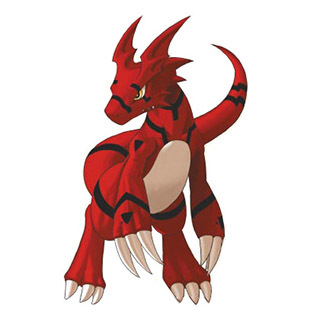 Its Signature Move is destroying rocks with its sturdy foreclaws (Rock Breaker). Its Special Move is spewing out a powerful flame shot (Fireball). The engraved "Digital Hazard" mark has vanished. That is because it accepted and contained its power within its body. It still hasn't awakened to that power, but if it grows up the right way, it can be said that its qualities for maturing into a true guardian of the Digital World will have improved. Since its instincts as a Virus-species have also increased, its personality has become more aggressive, and it acquired its striking technique "Fire Mitt", where it envelops its arms in its Special Move "Fireball" and beats the enemy. 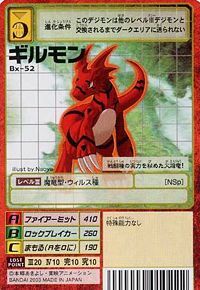 Although it is still a Child, its latent abilities as a "Combat Species" are very high, and it hides the ferocious personality of a carnivorous beast. It had the engraved "Digital Hazard" mark, which is inscribed on those who possess dangerous "power", on its abdomen, but since it contained that "power" within it due to the effects of the X-Antibody, that mark has vanished. Special Move: Envelops its arms in flame shots and strikes the enemy (Fire Mitt). May come from guilty or a reference to the "Gila monster", which is a type of lizard. 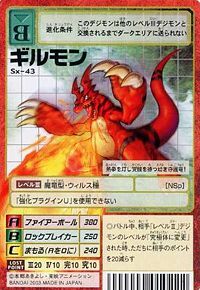 Sets its claws ablaze with an explosive Fireball. Fireball  ファイアボール Faiābōru Pyro Sphere Shoots a red-hot fireball from the mouth. Takes advantage of its claws' sturdiness to smash its adversary to bits. Evolves from Kyokyomon. 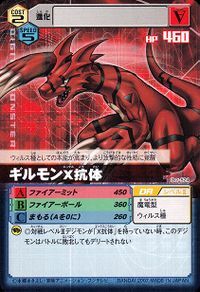 Can evolve to Allomon X-Antibody, Ginryumon, Growmon X-Antibody, Monochromon X-Antibody or Tobucatmon. This young guardian dragon lights its burning fists, awaiting its awakening! This flame dragon hides the true abilities of the combat species! Its instincts as a Virus attribute have heightened, awakening an even more aggressive personality within. This page was last modified on 18 April 2019, at 04:32.